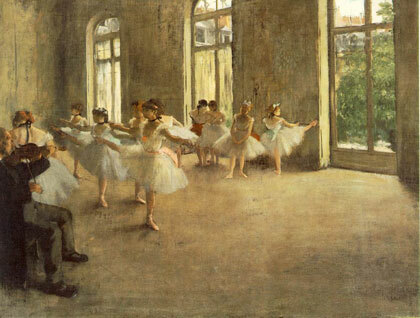 Edgar Degas was born on July 19, 1834, in Paris France. His father was a banker and his mother an American from New Orleans. At age 11, Degas began going to school in the Lycee Louis- le-Grand and graduated in 1853 with a baccalaureate in literature. When he was 18, he turned his room into an artist's studio and started making copies in the Louvre. In 1855, he received admission to the Ecole des Beaux-Arts, where he studied drawing with Louis Lamothe learning the style of Ingres. About a year later, he traveled to Italy and would stay there for three years to paint copies of Michelangelo, Raphael, Titian, and other artists of the Renaissance. During this period that Degas studied and became accomplished in the techniques of high, academic, and classical art. After staying in Italy for three years, Degas continued his education by copying paintings at the Louvre; he remain to be an enthusiastic copyist well into his 30s. His first piece of art that was exhibited, Second of War in the Middle Ages, attracted very little attention to people. Over the next five years he still exhibited his art at the Salon, but he stopped submitting his history paintings and his main piece: The Fallen Jockey (Salon of 1866). After the Franco-Prussian war, Degas went to New Orleans, Louisiana, to live with his brother and other relatives. He started producing paintings mostly depicting family members. One of his paintings, which depict a scene at The Cotton Exchange at New Orleans, gained popularity back in France and was his only work purchased by a museum (that of Pau) during his lifetime. His artistic style is often considered as an Impressionist, but it is an insufficient description. Fredrick Hartt, an art historian, says, he "Never adopted the Impressionist color fleck," and he continually belittled their practice of painting in plain air. Degas has his own style, reflecting his deep respect for the old masters and great admiration for Jean Auguste, Dominique Ingres, and Eugene Delacroix. He also collected Japanese prints, which influenced his work. By the late 1860s, he went from initial forays into history painting to an original observation of contemporary life. Degas work was controversial, but was generally admired for its draftsmanship. 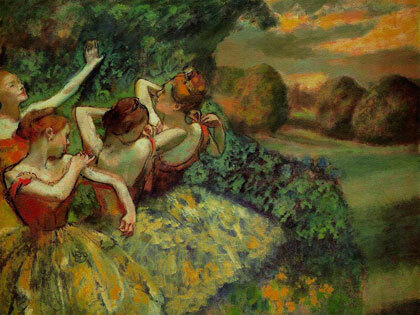 Towards the end of his life Degas is now considered "one of the founders of impressionism". Most of his paintings are now on display in many museums.